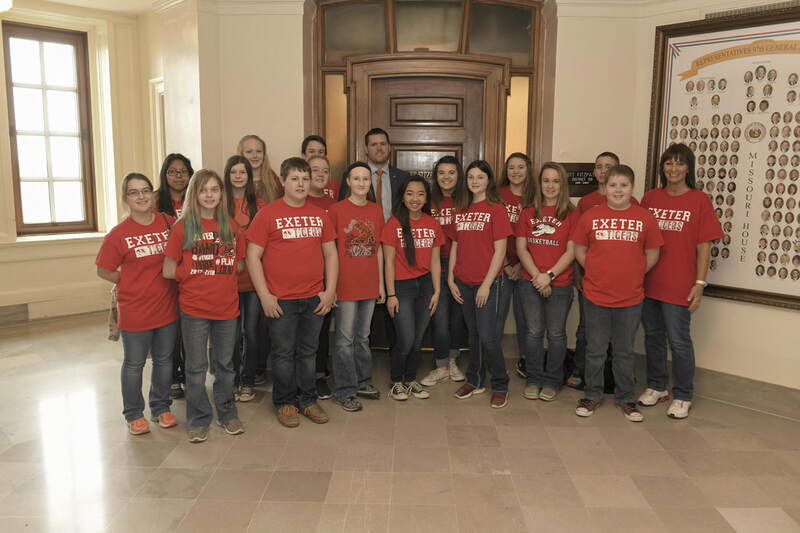 Exeter National Junior Honor Society members recently traveled to Jefferson City to tour the State Capitol. They toured the Supreme Court, Governor’s Mansion, Whispering Gallery and Dome during their trip to Jefferson City on March 6. They also were able to meet with Rep. Scott Fitzpatrick and tour of the House Floor. Those in attendance are pictured above, from left to right. In the front row: Shaylee Phillips, Levi Gautney, Aubree Reed, Isabelle Lee, Madison Crumpler, Hailey Mattingly and Cooper Patterson. Second row: Aubrie Graham, Ibhet Alcaraz, Halie Nelson, Aubry Antle, Jolie Mattingly, Tori Rose, Austin Mattingly, and NJHS adviser Mrs. Karla Payton. Back row: Abbi Caddell, Lane Willis and Representative Scott Fitzpatrick.